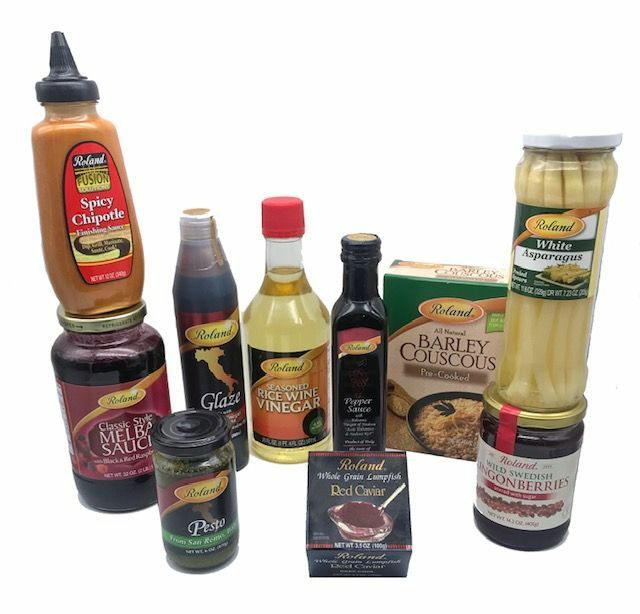 Roland Foods Gourmet Gift Pack is the perfect gift for the gourmet food lover, aspiring chef or gourmet food connoisseurs in your list that appreciate the quality of the Roland premium brand. 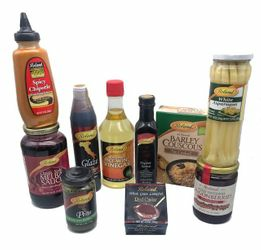 The gourmet gift pack comes complete with flavors from all around the world, making it an excellent Thank You present. You can't go wrong with Roland! Gift Pack Contains Rice Wine Vinegar, Balsamic Vinegar, Spicy Chipotle Finishing Sauce, Caviar, White Aparragus, Couscous, Pesto, Lingonberries and Melba Sauce. Productos Gourmet marca Roland para regalopara regalo son el regalo perfecto para los amantes de la comida gourmet, los aspirantes a chef y los conocedores de productos gourmet que aprecian la calidad de la marca premium Roland Food. El paquete de regalo Roland viene complemento con sabores de todo el mundo, convirtiendolo en el regalo perfecto para decir "Gracias. "� No te puede ir mal con Roland! El paquete de regalo contiene: Vinagre de Vino de Arroz, Salsa Picante de acabado sabor Chipotle, Balsamico, Caviar, Esparragos Blancos, Cuscus, Pesto, Arandanos rojos y Melba Sauce.